Luckily for me, this weekend was a horror double feature, so I got to see a much better movie too. Also, I watched them in the correct order. I feel like maybe there’s something wrong in my head that causes remakes not to bother me. I mean, in advance. Many of them bother me after the fact, and yet I continue to reserve judgment. Luckily, the person who remade The Hills Have Eyes understood the spirit of the original movie. That is, that sometimes and for no good reason, people accidentally cross some invisible line and step out of the everyday world and directly into hell. They don’t deserve it, and it’s usually upon them before they even realize that anything is wrong. Before they can realize that anything is wrong, because it still looks and sounds and smells just like the regular world. But then, that’s what makes it horrifying. Of course, after doing all of that so very properly, they had to go and drain a lot of my goodwill by tacking on five minutes’ worth of Godzilla-style morality tale into the climactic third of the movie. Other than that, though, and some over the top orchestration? Really good stuff. Second-best movie of the year so far. This entry was posted in Film on March 28, 2006 by Chris. What we have here is a movie that breaks two rules even before you’ve walked into the theater. 1) It’s a movie based on a video game, but the video game doesn’t exist. (Which is a pity, because we could build it. We have the technology.) 2) The title is instructive rather than descriptive. Well, okay, maybe that’s not actually a rule, but it seems like it should be. Horror movie titles mostly tend to tell you either when you’re going to die or what is going to kill you, or every now and then why you’re going to die. Telling you to Stay Alive is both unprecedented and really quite redundant. Although I suppose Scream was kind of the same way. Unfortunately, all similarities to Scream that I will be able to include in this review have come and gone. Basically, someone without a talent for tying up stray plots or thinking up particularly scary (or even gruesome) death scenes watched The Ring, and decided that if watching a tape can kill you, then by God, playing a video game can too. So, some gamer geeks play the video game, and then die. (Shocking!) Inevitably, the game was far better than the movie. The problem is, unlike the standard for this formula, I can’t even comfort myself by going back and playing the game. You would think that after liking a movie a whole lot, I would be compelled to get out there and spread the word, right away. And that would be very rational of me. Nevertheless, here I am more than a week after seeing V for Vendetta, and obviously I’m only just getting here. This is a movie I’d have been perfectly happy to see again in the same week, mind you, only my mom has yet to be up to it. Plus, there’s this whole test-studying thing going on, but I’m nearly done there and also I digress. So there’s this movie, right? In a lot of ways, it’s a straight up revenge movie in the fine tradition of Sudden Impact, Death Wish, or I Spit on Your Grave. At first that bothered me, because I had the idea that it was a meaningful, important film. But then it stopped bothering me when I realized that it could be both. If your revenge is grand enough and the cause is dire enough, you can be the match that sets off hundreds of pounds of gunpowder. Metaphorically speaking, of course. And I’m impressed that in the middle of a movie that I’m willing to compare to Death Wish, there could have been something as moving and true as Valerie’s story, which segment was worth the price of admission all by itself. It’s misleading, because it looks like a pointed political allegory condemning the way we’re living our lives here in the western world these days. And, okay, maybe it is. But what makes it misleading is that it really isn’t just about right now. It’s about any society that allows its decisions to be made by its fear, and if that seems like a timely topic just now, maybe it just means that more people need to hear the message. Also? All of the acting was great, and I have no complaints about the scripting. Best movie so far this year, and unless its predictive value is a little stronger than I’m confortable with, it will be the movie that stands the test of time. This entry was posted in Film on March 25, 2006 by Chris. And then, because apparently I was having a busy day, I saw Adaptation. It’s… it’s quite a movie. It’s a movie about the screenwriter’s struggle to write the screenplay adaptation of a book about flowers, which is really a loosely connected set of essays and personal thoughts. His goal is to not impose any Hollywood crap onto his adaptation, but instead remain as true to it as possible. The problem he discovers is that it’s impossible to write a movie without a plot, or themes, or events, or characters that grow and change. And… it’s almost impossible to talk about it in more depth without spoiling things. I shall say now that I really enjoyed it a lot, that I was laughing almost constantly, but that it probably isn’t the kind of movie that I’d want to watch over and over again. It made a good story, and I think I’m glad I watched it. I’m pretty sure on the whole the message is that our government hasn’t been handling the region well since time out of mind, and also that oil is mostly bad for us. (My favorite single moment was the awards ceremony for Oil Man of the Year, because the award was presented by the Moneybags guy in the Monopoly boardgame. No lie, I swear it was him.) Still, though, I’d be more comfortable knowing to what extent it was non-fiction and, well, having a better idea of what actually occurred in the plot. Oh, and what if anything Syriana actually refers to. This entry was posted in Film on March 12, 2006 by Chris. Another series complete, Dave Duncan’s Man of His Word. I said that the stakes were starting to rise in Perilous Seas; it is only right that the stakes should reach epic proportions in the final volume, Emperor and Clown. To give you an idea, Rap’s dealings with the Imperial family and the four Wardens (sorcerors of exceptional power to whom magical law enforcement and the good of the Impire is entrusted) are not the largest stake of the story. As much as I enjoyed the series, I spent a lot of time while reading in concern over the tale’s high-powered turn. As our hero says often, people with enough words to be sorcerors are so far above the petty concerns of mundane people as to be men observing ants. It’s hard to hold the interest of an ant once his fellow ant has been elevated to human-status, I should imagine. (Unless the ant is a teenage boy.) Luckily, Duncan was able to avoid most of the apparent pitfalls and put together a worthy conclusion, and even (if the back flap is to be believed) leave open the door for a subsequent series, A Handful of Men. I suppose this makes it time for another bookstore jaunt or three. This entry was posted in Words on March 12, 2006 by Chris. It’s like this. 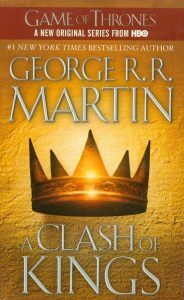 I read (well, reread) A Clash of Kings over such a long period of time (3, 4 months?) and with so many books in between that I can’t really put together any thematic opinions. I know I liked it, still. I know some characters were more annoying this time (Sansa, Catelyn) while others were more sympathetic (Theon). I know I begrudge the lack of frozen zombies. For the most part, though, I remain in awe of several excellent character studies, and of how Martin really captures the ‘world will burn while mankind fiddles’ feeling that Jordan grasps for, even though Jordan has lots of overt doom and all of Martin’s doom is naught yet but whispers on the wind. This entry was posted in Words and tagged A Song of Ice and Fire, epic fantasy on March 10, 2006 by Chris.